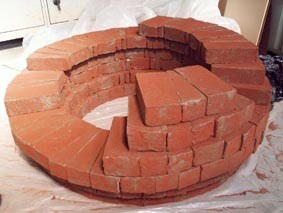 I spent the majority of last week working at the Coleford Brick and Tile Company in the Forest of Dean. The directors have been very generous, (once again) in allowing me to work on the factory floor and ‘play’ with their wonderful materials and products. 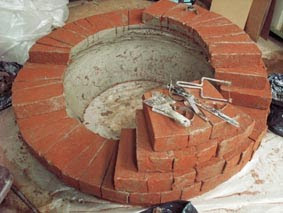 I’m making some large vessels – some one metre in diameter, out of carved ‘green’ bricks. The process involves piling the bricks into a rough shape before carving the surfaces to achieve a smooth effect. 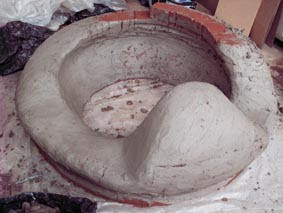 Once it’s all dried, it will be disassembled, carefully labelled and then fired in the giant gas kilns at the works.